The Mayor of the Gold Coast, Tom Tate and CEO of Destination Gold Coast, Annaliese Battista were among the dignitaries that officially opened voco Gold Coast at a packed ribbon cutting ceremony at the hotel this morning. 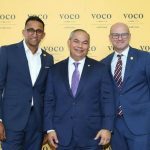 The opening of voco Gold Coast represents IHG’s (InterContinental Hotels Group) first hotel globally for its new upscale hotel brand: voco™, just five months after it was launched. Owned by Australian property investment firm SB&G Group and located on the shores of the Gold Coast, voco™ Gold Coast is now open for guests to soak up the sun, sand and sea in Australia’s beloved Surfers Paradise. voco™, inspired by the meaning ‘to invite’ or to ‘come together’ in Latin, will combine the informality and charm of an individual hotel, with the quality and reassurance of a global and respected brand. The public spaces of voco™ Gold Coast emphasise this social element, fittingly named Social House Café, which collectively houses a bar and lounge within the venue, offering a space for everyone. With 389 rooms, the property is situated in the heart of Australia’s iconic Surfers Paradise precinct and steps away from Queensland’s famous beaches. The hotel offers all the features that guests can expect from the upscale voco™ brand including two swimming pools, gym facilities, L’Aqua Day Spa, 800sqm of meeting space and expansive views of both the ocean and hinterland. Multiple dining options are also available in the hotel’s three unique restaurants – Waves, Clifford’s Grill & Lounge and Social House – all designed to offer vibrant social experiences for voco™ guests to enjoy. voco™ Gold Coast also offers several exclusive features that sets it apart from existing hotels, starting with their onsite beehives, producing honey for various uses throughout the hotel. The strong sustainability focus also promises refillable dispensers for products such as soap, along with a high-end Aveda amenity and an initiative with Gold Coast City Council to ensure all kitchen waste is recycled. 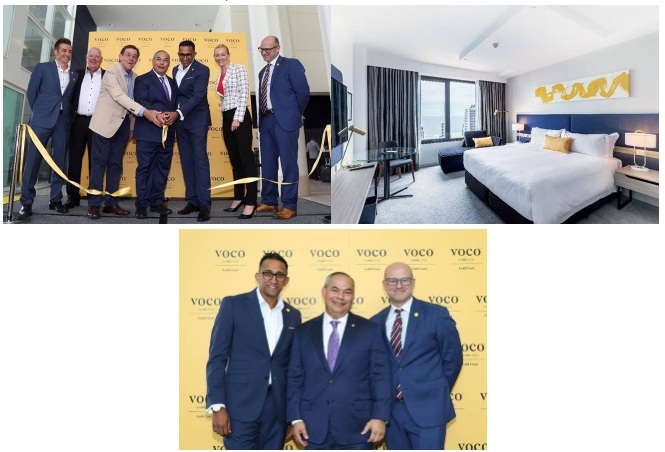 The voco™ Gold Coast signing was announced by IHG and owners SB&G Group in June 2018, coinciding with the global launch of the voco™ brand. With six signings to date, in addition to the four properties that will rebrand as part of the UK portfolio deal, there are expected to be more than fifteen signings in total for the brand by the end of 2018. These include three signings in Australia, in Victoria’s wine region, Yarra Valley and in the heart of Melbourne’s bustling CBD as well as a number of properties in the UK. The opening of voco™ Gold Coast will be quickly followed by hotel openings in Solihull and Cardiff in the UK. To tap into the excitement of the Gold Coast and embrace the playfulness of the voco™ brand, the new hotel offers a calendar of social events held within their street facing public spaces from a daily high tea experience to weekly trivia nights, among many others. This distinctive brand will offer owners the ability to drive higher returns through delivering a compelling guest experience and leveraging IHG’s powerful systems. This includes best-in-class revenue management and technology capabilities as well as IHG® Rewards Club, one of the world’s largest hotel loyalty programmes. To celebrate the launch of voco™ globally, IHG Rewards Club is offering 10,000 Bonus Point Packages at our new voco™ hotels around the world for stays between November 2018 and February 2019. Additionally, members can enjoy 50% off Reward Night redemptions at our new voco™ hotels. Terms & Conditions apply, please visit vocohotels.com for more information.